René Lacoste founded La Chemise Lacoste in 1933 with André Gillier, the owner and president of the largest French knitwear manufacturing firm at the time. They began to produce the revolutionary tennis shirt Lacoste had designed and worn on the tennis courts with the crocodile logo embroidered on the chest. René Lacoste, the company's founder, was nicknamed "the Crocodile" by fans because of his tenacity on the court. Lacoste today includes a large collection of apparel for men, women and children, footwear, fragrances, leather goods, eyewear, watches, belts, hometextiles and mobile phones. The 1980’s was the golden era of tennis and in that time Lacoste sunglasses were launched. Aviator sunglasses were one of the most popular choices in the Lacoste sunwear collection historically. Eyewear attributes include relaxed, casual fit, classy, comfortable and stylish, colorful, fresh and unconventional chic. 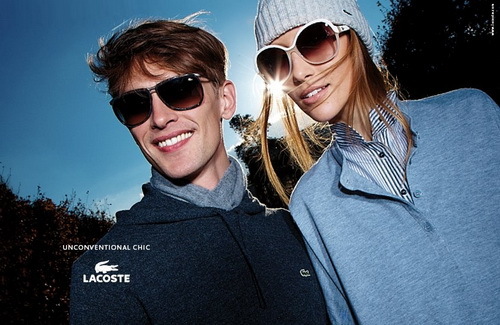 Sunglasses from Lacoste are available for men and women in a variety of shapes, colors, styles an materials. All Lacoste glasses carry their traditional crocodile logo. More than 75 years after its creation, Lacoste has become a lifestyle brand which exemplifies elegance and comfort.